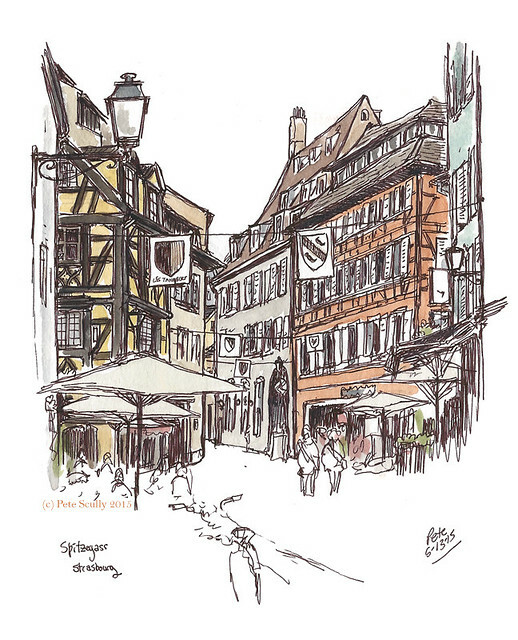 More sketches from Petite France, the old picturesque part of Strasbourg, famous for being where they put diseased soldiers centuries ago. The scene above is one of the most beautiful views in the city, where one of the canals of the river Ill twists past the narrow medieval lanes surrounding the Place Benjamin Zix (“Zixplätzel” in Alsacien). Benjamin Zix was a painter and sculptor in the Napoleonic era, born here (well, on rue des Moulins) in 1772. The building in the middle is the Maison des Tanneurs, dating from 1572, which is now a restaurant. I sat here by the narrow lock for a couple of hours, as tourists walked by, and other tourists in groups whirred by on those Segway things. I don’t know how you can go around Petite France on those Segways (which remind me of the STAP flying platforms ridden by battle droids in the Phantom Menace while attacking Gungans on Naboo), but a lot of people did manage it. Below is the rue des Dentelles (Spitzegass), which I sketched on the first day. There is a really interesting shop there called ‘Un Noel en Alsace’, which sells Christmas ornaments, mostly Alsatian. 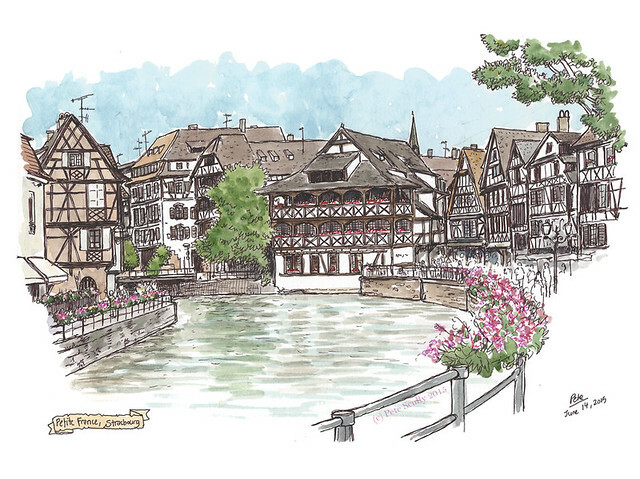 The most recent visit to Strasbourg I had made was in December 2004 with my wife, when we came to visit the Christmas market, or “Christkindelsmärik”. Strasbourg, if you don’t know, is the home of the traditional Christmas market. It is the oldest one in Europe, dating back to 1570, and is a lovely experience (albeit rather crowded). Strasbourg calls itself the ‘Capital of Christmas‘. It seemed to cover most of the centre-ville, and there was mulled wine (or maybe gluhwein, both of which I’m not keen on) being passed around. I do love Christmas time though, and Alsace does it pretty well. 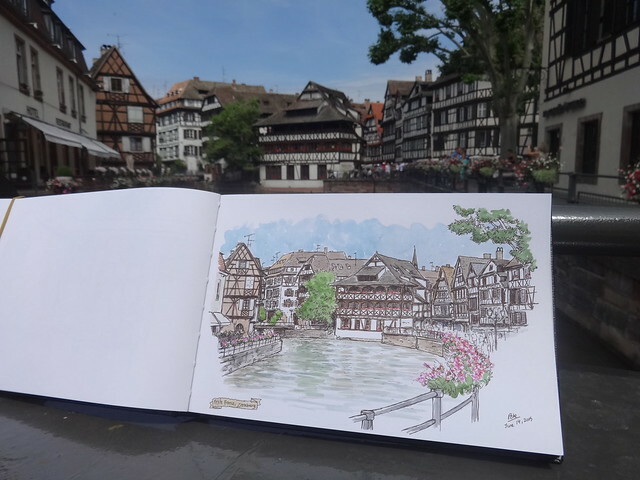 On the final day in Strasbourg I decided I would do more exploring than sketching (I spent a lot of time in bookshops), but I just had to go back and sketch more Petite France. I wasn’t done with Petite France yet. There was one scene which again is picturesque, tourist-photogenic, detail-heavy timber-framedness. The view from the Pont St. Martin towards the back end of the rue des Moulins (below). I spent an hour and a half sketching all the ink, and added most of the colour later. Below me, the water was gushing down from the locks. Behind me, the sound of children playing at a nearby school. Around me, tourists from all over the world lining up to take pictures of each other. I did consider making this a two-page panorama (and even plotted out the left hand page) but knew I wouldn’t have the time to draw it. Still, I’m well happy I took the time to come and draw this. Ah… your wonderful sketches take me back. 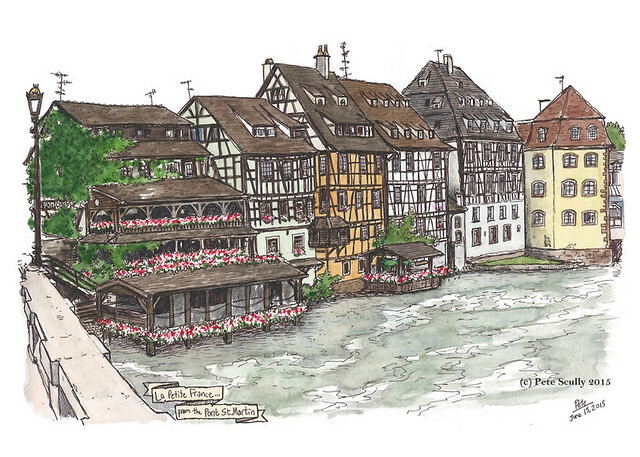 We visited Strasbourg frequently when we lived just over the border in Germany (in Kusel). That scene of the curved canal lined with those wonderful buildings is supremely picturesque. It’s no wonder you spent so long sketching it. Your drawings are charming.